How did you get into sailmaking and learn to make sails? I was just walking into a local loft to get sails for my San Juan 24 right after grad school. I wasn’t very excited about my current job and ended up talking to the owner of the loft for a while. It sounded like a really cool job. From there I signed up and started making sails! How long have you been in sailmaking? That was in January of 1998, so 17 years now. What is your favorite part of being a sailmaker? Getting to meet a lot of different people and working with different sailors is my favorite part. We get all of these really cool people in the loft with their own unique story. When I get to join that story as a sailmaker I get a lot out of that. There are definitely sails that have more soul, sails that carry on a legacy as in classic yachts or cruising yachts that carry on around the world. Working with those yachts and adding to the story is very interesting. What was the first sail you ever made? The first sail I remember making was for a guy I sailed against on a 42 foot Beneteau S7. It was a set of racer-cruiser sails. The sails were a radial design using a polyester cruising laminate. He was faster with the new sails, but my San Juan 24 was still faster. 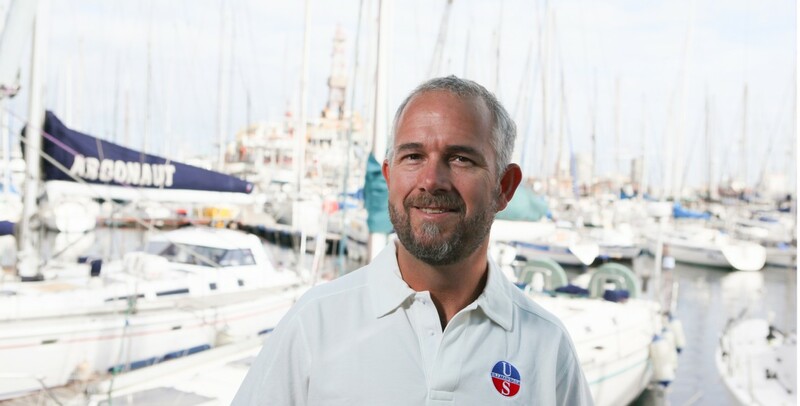 How did you meet/hear about David Ullman and decide to join the Ullman Sails group? When I first joined the loft we were a dealer for a different sailmaker. I learned about Ullman Sails by racing against them, the sails were often from boats that were sold by Doug Fisher in Ullman Sails Florida and they would always beat ours! The first time I saw the red and blue logo was when I was sailing with a customer who had a Henderson 30. Joining the Ullman Sails group was a pretty straight forward decision, our loft eventually switched over to be a dealer for Ullman Sails before I owned the loft. When I took over the business we knew we were doing well with the brand and the group so we invested a little more and became a fully fledged loft for the group. That was in 2005 so we’re just now celebrating our 10th year as an Ullman Sails loft. As part of the group we’ve been able to give racers a real edge that we wouldn’t have been able to otherwise. Our loft has always had an advantage when it comes to serving cruising sails, we’re very experienced in all the cruising needs like sail adjustments, hardware and so forth that cruisers often don’t even realize they need. With regards to racing we also have a lot of experience, but with some of the top designers and guys from the Ullman Sails group we’re able to offer a lot more performance than we might have. And, I like being able to build sails in-house, being able to make adjustments and quick changes on the floor gives us flexibility that adds a lot of value. Being part of the Ullman Sails definitely allows us to keep that expertise while giving us more tools to use and access to expertise solving the same types of problems. What are some highlights of your time in sailing and sailmaking? Winning our class in the 2014 Newport Bermuda race was a real highlight. It felt really good to be beating some really impressive competitors in the event. Another highlight was building classic sails for the Jamestown ship. The sails were supposed to be museum quality sails. We had to use all the traditional techniques; there was no metal in the sails, only cloth and rope. We had to do a ton of research on how to build the sails, what materials to use, and so on. It was pretty tricky too because sailmaking is something that has been handed down as a trade over generations, there aren’t any guidelines outlining how to build sails hanging around from the seventeenth century. Between our research and copying some of the techniques and patterns from the old sails we were able to do a really cool job. What is one of the biggest events near your loft? What can you tell us about it? Definitely the Hospice Turkey Shoot Regatta which takes place in October every year. It is a charity event that raises tens of thousands of dollars and awareness for hospice care. Boats have to be at least 25 years old to participate and we get a lot of classic and wooden yachts out on the water. I help to run the regatta now which is really cool. Over 100 boats participate on the Rappahannock River. I think Sunday is the coolest day where there is a massive pursuit race, with everyone sailing the same course. As a result you have some old Keelboats racing against Skipjacks and other more traditional yachts. The atmosphere at the event is also really incredible. Since it’s for charity and caters to more traditional sailing I think everyone takes on a different attitude that’s really refreshing. Well that has to be the Southern Chesapeake. I love it! It has good wind and climate most of the wind, its not crowded and there are simply tons of places to go. I think Bermuda is a cool place to go too, but you can only sail in the harbor or in the ocean, not a lot to explore. I think a lot of places are like that, where the conditions are a little polar. Either you’re in port or the harbor or you’re out exposed to the elements. What is one of your favorite places to cruise? I want to go to southern Central America and sail around Panama and Honduras. It looks absolutely spectacular and not overrun with tourists. Also, you have to be a good sailor and know what you’re doing to get down there so I think the kinds of people you’d run into would be a little more serious.